#Rowing: The Afloat Rowers of the Year for 2015 are the Ireland men’s and women’s lightweight double sculls who qualified their boats for the Olympic Games in 2016. Claire Lambe and Sinéad Jennings needed to finish in the top 11 at the World Championships in Aiguebelette in August/September. They seemed well-placed in their semi-final to qualify for the A Final, but were pushed into fourth as Canada finished with a remarkable sprint. 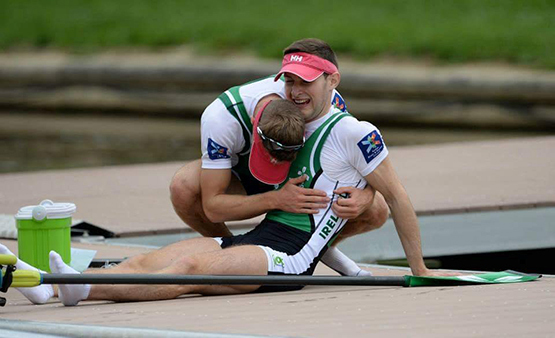 The Ireland crew changed tactics for the B Final, and it worked. They finished ninth. The men’s lightweight double of Gary and Paul O’Donovan had a similar qualification mark in Aiguebelette. To have a shot they had to finish in the top three in their quarter-final, and they achieved this, pushing Hayden Cohen and Peter Taylor of New Zealand into fourth. They finished fifth in their semi-final and then booked their Rio place with a fifth-place finish (11th overall) in their B Final, eking out a place ahead of Greece, who had finished eighth at the Olympic Games in London. Afloat wishes both crews and all the Irish rowing community the very best in 2016. Rower of the Year Award: The judging panel is made up of Liam Gorman, rowing correspondent of The Irish Times and David O'Brien, Editor of Afloat magazine. Monthly awards for achievements during the year appeared on afloat.ie. The overall national award has been given to the crews who, in the judges' opinion, achieved the most notable results and made the most significant contribution to rowing during 2015. Keep an eye on progress in 2016.